was certainly in order. 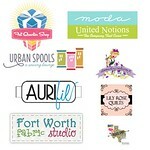 Join these Texas bloggers for a super sized quilt along beginning June 1st. 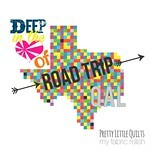 Melissa from my Fabric Relish has organized a road trip that takes you through some of best known cities and possibly some of the little known places in Texas. Each stop along the way will feature a quilt block and a little bit about the area. The Roadtrip is going to happen though out June and July with all kinds of giveaways along the way from the following sponsors. There is a saying that you is pretty common bumper stickers so I thought I would share here. 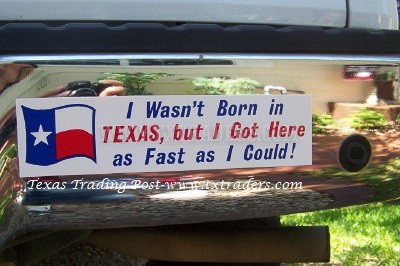 I came from Kansas to Texas when I was 5. Mark your calender. Where else can you take a 2 month road trip without leaving the comfort of your sewing machine? Oh can't wait!! We moved to Florida 3 years ago this June from Dallas, TX and I miss it SO much! Our family is from San Antonio, Houston, Austin all the way to Tyler. We miss every inch of it from the food, style, diverse landscape and of course the people. Beaches (and people) are nice here but there is nothing like the great state of Tejas so thank you! Do we sign up or just check in to see the blocks? Just follow along to get the blocks. It all starts June 1st.